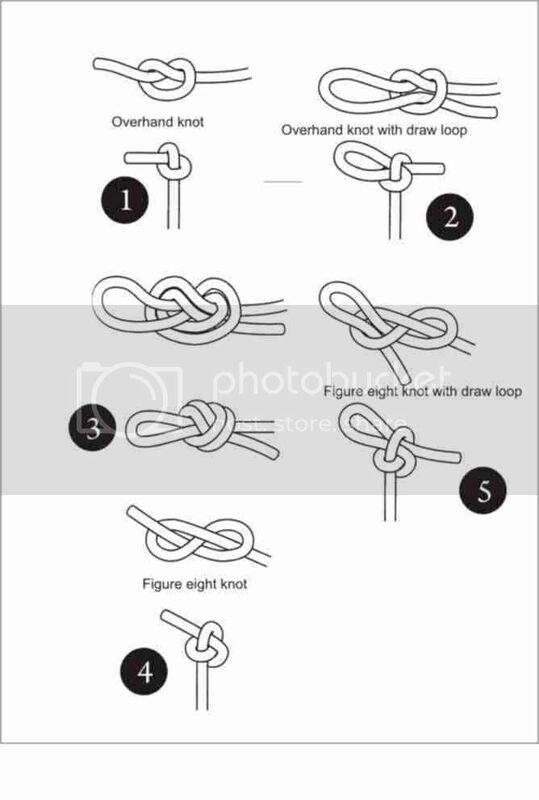 To prevent jib leads, main halyards, flag halyards, etc., coming unreeved from blocks, fairleads or other slots or holes, use a figure eight knot (4-5). This knot apperas to have been named by Darcy Lever. With or without a draw-loop, it is more easily undone than an overhand knot, and with one it may be slightly stronger (45-50%). do not leave it flat but pull the standing part so that the working end is pulled over and trapped beneath the bight. Altough bulkier than the overhand knot, it does not have a larger diameter (contrary to ehat many knot enthusiasts will tell you). It will pull out of the same size hole as the overhand knot. If you need to use something bigger, choose Ashley's stopper knot.